Food gifts are always welcome, no matter how weird they may be. My friend Sally dropped off 2 huge lumps of fresh pizza dough from a famous New Jersey pizzeria early one morning as one of my holiday presents. I froze the 2 lumps knowing exactly what I would be making. When I was a kid, the only calzone you could buy at the local pizzeria was one stuffed with ricotta cheese and mozzarella and some ham. I would watch the hot ricotta and cheeses ooze out all over the paper plates and try to eat the heavy mess with my plastic knife and fork. Now that I am grown up (so they tell me), I can stuff a calzone with whatever I want. You are welcome to make your own pizza dough, but if you live by a good pizza guy, then buy it from him. My pizza guy (I am dough challenged), flipped and rolled out my circle of dough into a large flat circle, as if it were pizza night. I cut the circle in half with a pizza cutter to make 2 crescent shapes of dough. I cooked 2 sausage links with casing removed, and added 3 garlic cloves and a head of chopped, steamed broccoli florets to the same pot as the sausage. I cooked the broccoli and sausage together until the sausage meat was cooked thru. 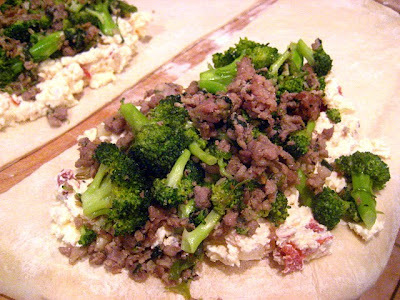 Spread some of the ricotta mixture on one half of a crescent, and top with some sausage and broccoli mixture. Repeat on the other half crescent. Fold dough over leaving 1" around the sides so you can seal them into tight pockets. Cut 3 slits on the top to vent. You will have 2 HUGE calzones, enough for a hungry family. Transfer to a parchment lined baking sheet with a heavy spatula. Bake at 450F for about 10-12 minutes until the dough is nice and golden and some filling is oozing thru the holes. Let rest 5 minutes before cutting open and serve with a side of tomato sauce. Looks good. How great to have your own pizza guy! That looks like one tasty calzone. My husband would want to sub the brocolli for pepperoni though...LOL. Those look amazing. 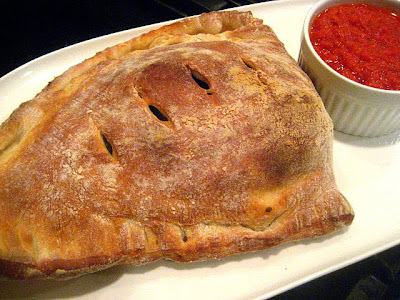 I make ham or pepperoni calzones pretty frequently, but these look delish!! Broccoli Rabe, Stacey. Broccoli Rabe. BTW, having a pizza guy is very important. You would be so easy to shop for! What a perfect gift, and you used it well. That crust is gorgeous-- and that cheese oozing out... it's 8am and I'm feelin' in the mood for some calzone. That's another "must make for the first time" thing on my list. I prefer calzones with veggies. I need to make one soon! This looks perfect! Great calzone. I've made stromboli's but never really did a calzone. What a nice friend - and terrific looking calzone. Makes me want to eat some of that tonight! What a perfect way to use that pizza dough! I love having access to good dough when I'm in a rush and don't want to bother with making it myself. Love what you added to yours, too! My introduction to a calzone was on the Camden campus of Rutgers via a food van. It was hot and greasy and I fell in love with it.I have to try this recipe. Wow, your calzoni look fantastic. 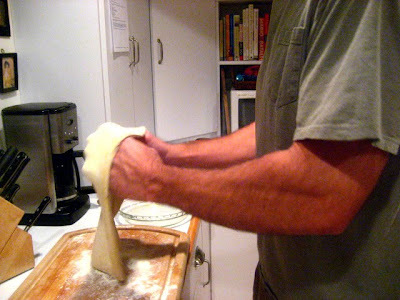 I need to make more calzoni in the near future; they are much easier to make than pizza...and more convenient, too. So enough about the calzone, Im more interested in this pizza guy!! yeah the one with the great arms!! I think I love him!!! !Oh yes, I actually do!!! I could use some of that dough! I made a veg version of this with veg sausage and broccoli rabe and my husband asked me to marry him. I guess he forgot we were already married. :) It was also a favorite dish of my clients. I'm sure your dough was better! 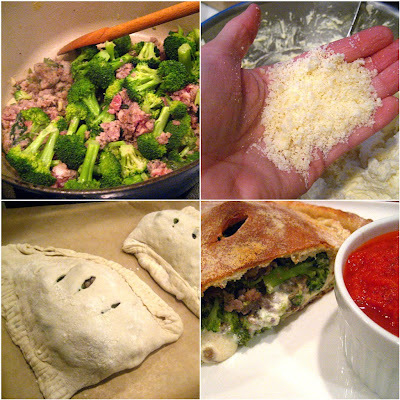 That calzone's crust looks amazing and I love the filling! My pizza guy is my hubby--he's in the kitchen right now making me GF pizza--our Friday night's ritual. It always taste better when he makes it. I never met a calzone I didn't like. 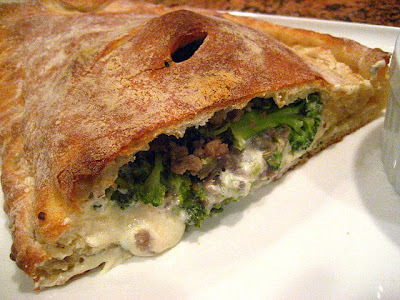 That is one gorgeous calzone... sounds delicious too... thanks for the great post! You did it again! Easy and inspiring to make. These sound wonderful.